Microsoft SharePoint is one of the top business collaboration resources today. Over the time, SharePoint has gained significant recognition for its ability to build a sound collaborative system among some of the most prominent organizations. Not only does it simplifies business processes, enhance productivity, accelerate growth but also provides a secure internal information sharing platform. 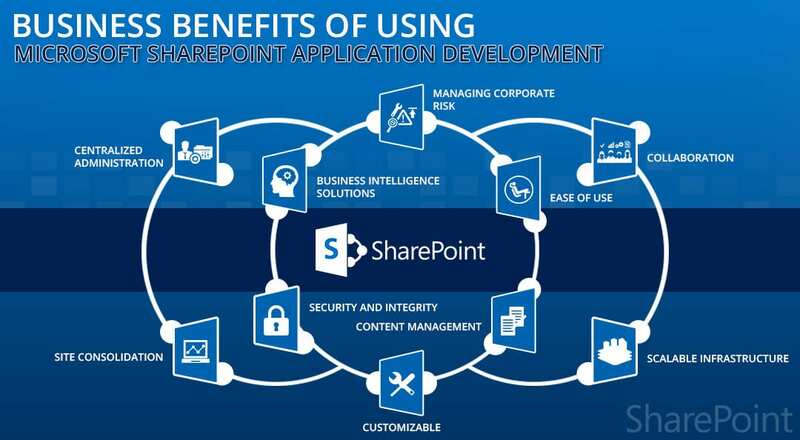 The 10 top key benefits of using Microsoft SharePoint application development are as follows. Benefit: Co-authoring, versioning, check-in/checkout. Allow members of the team to easily stay informed and connected throughout the project’s lifecycle and provide better performance and scalability with easy-to-use collaborative tools. Benefit: SharePoint allows you to build and add apps and services and allows the Design manager, multi-site publishing, along improve SEO performance and provides additional web components, flexibility, personalization. Benefit: It provides the ability to the organization to protect the integrity of data from unauthorized use and provide security at both a broad and single item level. If your company needs Sharepoint help with the implementation or Sharepoint development, Do Contact us Now info@viftech.com . Viftech Solutions has the personnel for Sharepoint consulting to assist any client in need of specialized professional assistance with all aspects of Microsoft Sharepoint. Adeel Ahmed is a Certified Microsoft Technology Specialist, and plays a pivotal role in SharePoint Development of Viftech Solutions (Pvt.) Ltd.